Known for her modern and bold aesthetic, this beautiful Vivienne Westwood Orb watch is just the daily glamour, the modem day woman needs. This watch features a charming silver bezel engraved with the iconic Vivienne Westwood orb logo. The silver dial is offset by a striking red strap. The watch is effortlessly finished with an Orb charm. Vivienne Westwood Orb Silver Dial Strap Watch is rated 5.0 out of 5 by 2. 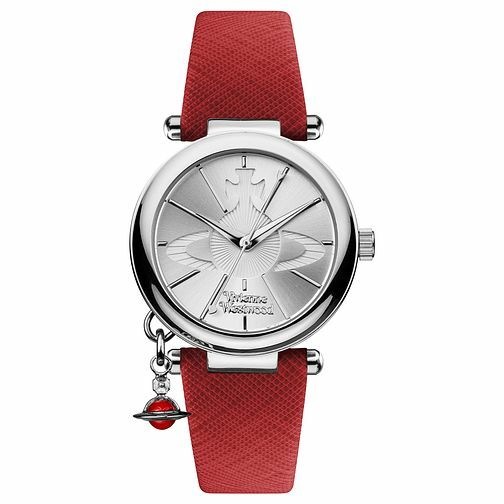 Rated 5 out of 5 by Anonymous from No where else I found this Watch When I was looking for red strap watches in general google search, I found Vivienne westwood red strap watch with orb design embedded inside worh silver dial. But the only place where i could find is Ernest ajones after several weeks/months of searching. I also received the product within 48 hours of ordering online in Ernest Jones website. Thank you for your excellent customer service.